Hillary Clinton surrogate David Brock says Bernie Sanders is going to the Vatican to be exorcized of demons. WASHINGTON (The Nil Admirari) - Today, Hillary Clinton surrogate David Brock - leader of the pro-Clinton super PAC Correct the Record - announced U.S. Senator Bernie Sanders of Vermont will be going to the Vatican on Friday for an exorcism. Brock claimed Pope Francis had entrusted him with the actual reason the Pontifical Academy of Social Sciences had invited Sanders to Rome. 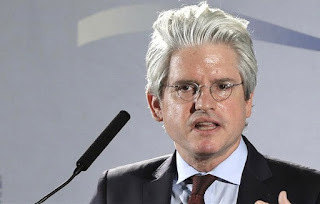 "I just got off the phone with Pope Francis, and he told me Bernie Sanders is going to the Vatican to be exorcized of demons, which have convinced him to challenge Hillary Clinton for the presidency," declared a grinning David Brock. Mr. Brock continued, "This should not be surprising to Americans, as only someone possessed by a demon, or Satan himself, would challenge Hillary Clinton for the Democratic presidential nomination." "Everyone not possessed by Satan or a demon knows the Democratic presidential nomination and the White House itself is Hillary Clinton's, and always has been," explained Brock. An unidentified member of the press asked Brock if he was saying every president in American history, including Hillary's husband, had been possessed by a demon or Satan. "Yes. Especially the ones who crusaded for the poor and other extremely vulnerable groups in our society," replied Brock.